Power Animal is a mystical creature, an animal spirit that guides and protects you and shares it’s power and wisdom with you. You’ll find your Power Animal in your sleep, while meditating or it can be an animal to whom you’ve felt strong attachment from ever since you were a child. Your life can contain many Power Animals but maybe there is one special animal that travels with you from cradle to grave. 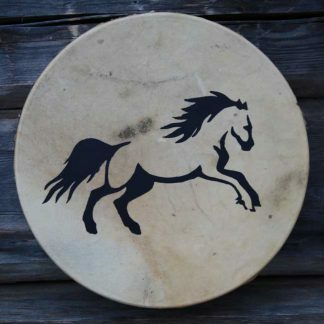 Our Power Animal drums remind you about these wise animal friends of ours. Playing these drums helps you relax and reach a meditative state in which you are closer to your Power Animal. You’ll find bears, wolves, elks, eagles, owls and other animals from Finnish wildlife. Which one of our Power Animals calls you? Drums are unique Finnish handcraft, made out of 7mm waxed birch plywood. The skin is Finnish undyed reindeer hide with hand painted Power Animals. The hide is genuine reindeer skin which should be oiled one to three times a year, depending on the usage. The skin is greased with a bees wax -based skin care product all around. The drums have been greased by us before shipment. The drum “lives” with the humidity, making the skin loosen up a bit when it’s moister and tighten up when the air is drier. Humidity affects the pitch of the drum. If the skin on your drum is too loose, you can dry it carefully in the sun or with a hair dryer. If the skin is too tight, loosen it by wiping with a damp cloth or by spraying some water on it. The skin doesn’t react immediately to tuning so give it few minutes to adjust. Don’t ever leave Sami Drum to extremities, such as a hot car or freezing cold as that might rupture the skin.